Last night, Marvel Studios rocked Hall H to the core with their presentation this year in discussion of their upcoming films that are to be released in Phase 3. Films that were showcased included Ryan Coogler’s Black Panther, Taika Waititi’s Thor: Ragnarok, Scott Derrickson’s Doctor Strange, Jon Watts’ Spider-Man: Homecoming, and James Gunn’s Guardians of the Galaxy Vol. 2. 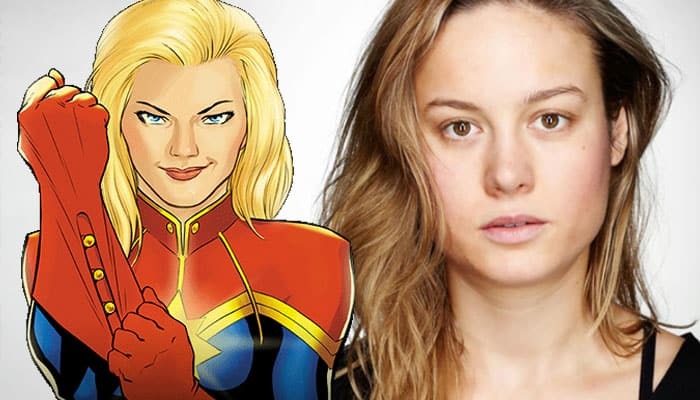 As exciting as it was to see these films be discussed and the trajectory of the Marvel Cinematic Universe’s narrative continue to rise, it was the studio’s official confirmation of Brie Larson being cast as Carol Danvers AKA Captain Marvel that brought the house down at Hall H and got the internet talking. So much excitement filled the web when fans everywhere finally realized that we got our Captain Marvel in the MCU finally cast. Marvel Studios President Kevin Feige expressed his excitement for Larson’s casting in an interview with comicbook.com. The first casting choice as our own studio was Robert Downey Jr. as Tony Stark. We set a bar that was very very high. Every time we bring somebody, whether or not it’s a co-starring role, certainly if it’s a starring role, we need to match that bar if it’s even possible. With Carol Danvers, with our first title female super hero in Captain Marvel we could do no less than that. The fact that Brie, even after she won her big Academy Award, was interested in coming in and talking to us about the character, really fell in love with this character, really fell in love with the notion of being a symbol that can inspire everyone. We were very lucky. We were very lucky that she agreed to come on board and agreed to come out tonight at the end of the panel. The thought of having an actress of an Academy Award-winning caliber speaks volumes to where the blockbuster business is today. Usually, big name actors would guffaw at the thought of joining a superhero film, but that is not the case anymore. It is even more telling thanks to Brie Larson’s enthusiasm in bringing this character to life on the big screen. Mr. Feige, I along with millions of fans agree with you. We are very lucky indeed. Only if you don’t count Marlon Brando (Superman), Gene Hackman (Superman), Jack Nicholson (Batman), Faye Dunaway (Supergirl), Tommy Lee Jones (Batman Forever), Morgan Freeman (Batman Begins)…Should I go on? Sloppy writing and reporting. Of all the names you listed, only one is female and none are the main character. None of those characters had the movie named after them. And considering the number of Oscar winners that aren’t on your list, it is accurate to say that Oscar level actors USUALLY don’t take these roles. The author didn’t say “never”. “We went with Brie, even though she was NEVER our first choice, because all the other options were taken”. I’m just glad that Emily Blunt was not cast for the role. That means she’s free to join the DCEU where she belongs! Hmm, interesting. Who would you cast her as? I’m not too sure yet. I just love Emily Blunt! Lol. And I was jealous when all of those Captain Marvel rumors started floating around. If she’s going to do a comic book movie, it better be with the DCEU! I’ve heard lots of people wanting her for Catwoman, and that would actually be pretty fantastic – she definitely looks the part. But in my mind, I’ve always pictured a slightly older Selina Kyle to pair with Affleck’s Batman. Carla Gugino is my #1 fan-pick for that role. I’m still holding out hope that we’re going to get Barbara Gordon at some point. I could totally see Emily Blunt playing her!